Manage to beat a stage at with your time at exactly 9:59 and you'll net yourself an easy 100000 points. When playing a level after enabling the level select cheat, pause the game, then press the C button to advance the game by one frame. When playing any level which you have accesed using the cheat menu , pause the game and hold down B. Whilst B is held down , the game will play in slow motion mode. When the "SEGA" screen fades, quickly press Up-up-down-down-up-up-up-up. If you have done this right, you should be able to scroll down to "Sound Test" below "Competition". The ups and downs are very difficult in the short amount of time provided, but with practice, it is pretty easy. To get all 7 Chaos Emeralds without having to complete their Special Stages, first enter the level select and sound test code. Go to the Sound Test and play the following tunes in order: 02, 04, 05, 06. You will hear an emerald sound if the code is entered correctly. 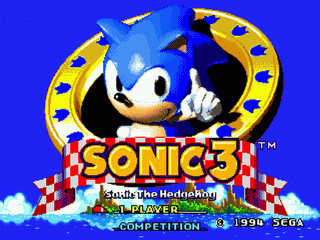 To get Super Sonic after entering the previous code, just select any level from the level select and start it. Once you acquire 50 Rings, do a double-jump to become Super Sonic. 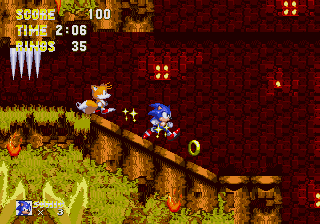 Start a one-player game with Sonic and Tails as the characters. With Controller two, you can take control of Tails while also using Sonic. On the level select menu, play sounds 01, 03, 05, 07. Highlight Special Stage 2 and press A + Start. Get up to Launch Base Zone. Sound any of the alarms, so that the Kamikaze birds come after you. Charge up a Super Sonic Dash in between the alarm, but do not let go of the button. The birds will continually crash into you. After about 30 seconds, you will have gained enough points to get an extra life. Continue the process for as many lives as you want. Start a game and go to Angel Island Zone Act 1. Go to one of the swings that you hang from and grab on. While Sonic is swinging, press Left, Left, Left, Right, Right, Right, Up, Up, Up. You will hear a ring if you entered the code correctly. Pause the game and press A to take you back to the title screen. Press Down twice to find the newly unlocked Sound Test menu. Enter it, where you can play all of the sounds/music in the game and warp to any level. After entering the level select and debug code, you can use the debug to turn yourself into Super Sonic without getting all of the Chaos Emeralds. With the Debug On, go into any level and press Button B to turn yourself into a ring. Then press A to turn yourself into a monitor. Now, press button C to duplicate the monitor, and then B again to change back into Sonic. Jump on the monitor and you will become Super Sonic. Now, without turning the system off, remove the cartidge, and insert the Sonic 3 Cartridge. Reset the Genesis console, keeping the A button held down at all times. On the title screen, press down untill you see sound test. Success! you now have an easy (but different) way to access the level select and sound test! If you are afrade of this damaging your games, please, don't try it. I have never had any game be damaged by this trick. BONUS: If you look at the level Icons, you will see the icons from sonic 2. If you look carefully, you will see the Icon for Hidden Palace Zone, a level that was "removed" from Sonic 2! Make your way to the end of Act 1 of Hydrocity Zone (Zone 2). When facing the mini-boss, keep yourself underwater until the water warning music plays. Then jump out of the water. The game should now be playing the mini-boss music from Sonic and Knuckles, which wasn't out at the time (the music was evidently included in Sonic 3 to make the backwards compatibility feature easier). In the Icecap Zone Act 1, when you come to a wall that only Knuckles can bust through, Hold the Down button until sonic or tails looks down, and the screen pans all the way down. Then Press up and jump at the same time. The screen will start to rotate, walk in the direction of the wall and you will walk right thru it. This only works on Act 1 of The Icecap Zone. 29.08.2007 19:18	 да, игра прикольная слов нет! 17.06.2007 14:25	 Игра супер! Я когда мелкий был резался во всю.Прошёл её раз 10.А сейчас играю и немогу пройти. 06.06.2007 16:37	 Я обожаю эту игру! Это прикольная, просто опупительная игра! Ха-ха-ха!